So apparently this sold the most copies in the wake of its nomination for the Booker Prize shortlist, but did not win in the end. But winning isn't everything, right? 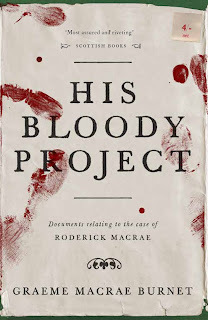 His Bloody Project begins with a preface by the author, Graeme Macrae Burnet, recounting how he found the manuscript that you are about to read, intact and inexpertly bound, in the archives of an Inverness repository. 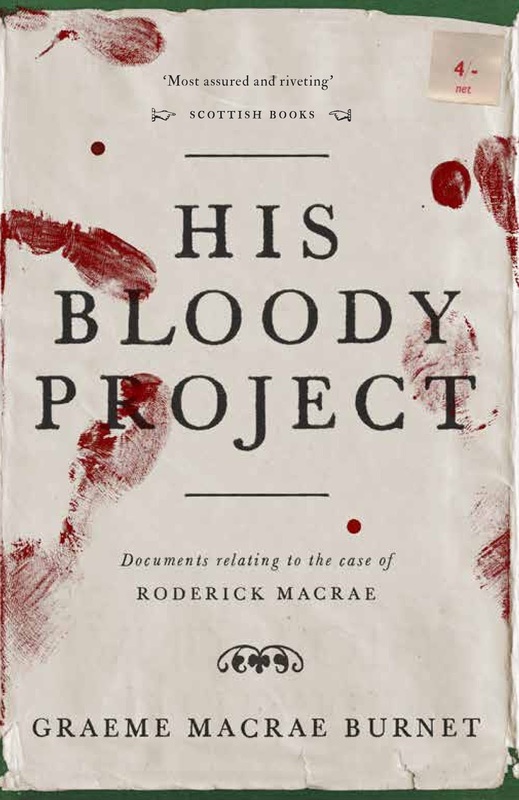 The story re-imagines the supposedly real-life story of 17-year-old Crofter's son Roderick Macrae, perpetrator of a triple murder in 1869, the bloody project from which the book gets its name. The narrative is constructed of testimonials from Roderick's neighbours, teachers and other crofters in the township. Opinions of him vary wildly, from gifted (if slightly contemptuous) scholar, to quiet loner, to murderous, dead-eyed miscreant. After the short testimonials, Roddy tells his own story, in an unlikely, flowing prose from his prison cell, recounting the series of events that began with his mother's death, and led up to a triple homicide. It's interesting in that it is not a whodunnit, because Roddy is never in any denial about his guilt. The interest arises in why. Why did this boy, an apparently clever, thoughtful lad feel driven to murder his neighbours? A boy that, on his first day of employment working for the landowner on a shooting party, scared a stag off to save such a magnificent animal from being slain. What drives a person like that to kill someone? Not just kill them, but full blown smush them to a pulp? It's an intriguing little book- sort of a literary found footage. It's unexpectedly humorous in parts, with an oddly compelling narrator in the softly spoken, literary Roderick. It reminded me in parts of Hannah Kent's Burial Rites, in that it is a memoir written with the noose around the neck. The difference was, that narrator was innocent. It reminded me most of Alias Grace by Margaret Atwood; the idea that multiple versions of a person exist to different people perceiving them. The idea that guilt and innocence are slippery ideas, that if a person is devious enough, clever enough, if they believe their story enough they can dupe almost anyone. The innocent party becomes a character to be played, even to themselves. In His Bloody Project, the reader is left to make up their own mind about the accused, but they are heavily influenced by his own, lengthy account. We end up sharing Macrae's own perception of himself, whether that is what his peers see or not. We see his background, his treatment at home. We see how his beloved sister is gradually dimmed by toil, abused and then extinguished. We see his aspirations, his unlucky sequence of events. His acceptance of them. His arrival at the only conclusion; a win-win- he is freeing his father from both the burden of his torment, and the burden of his useless son. It's an enjoyable book that paints a picture of the bleak inevitability of life in the Scottish islands- a simple, ancient life made unbearable by the arrival of power and tyranny. It's unusual in its format, and some readers might be put off by the verbose prose of Macrae's account of his life. I've just realized the author shares a name with his protagonist. *so dense*. I'd definitely recommend this to people who enjoyed Alias Grace, and to readers of crime generally. It's certainly a new and compelling twist on a very, very familiar genre. It must be hard to write a really original crime novel, but GMB has managed well. Memorable.